Multi-core multi-processor machines provide parallelism at multiple levels, including CPUs, cores and hardware multithreading. Elements at each level in this hierarchy potentially exhibit heterogeneous memory access latencies. Due to these issues and the high degree of hardware parallelism, existing OpenMP applications often fail to use the whole system effectively. 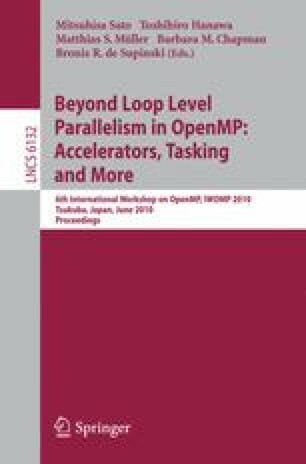 To increase throughput and decrease power consumption of OpenMP systems employed in HPC settings we propose and implement process-level scheduling of OpenMP parallel regions. We present a number of scheduling optimizations based on system topology information, and evaluate their effectiveness in terms of metrics calculated in simulations as well as experimentally obtained performance and power consumption results. On 32 core machines our methods achieve performance improvements of up to 33% as compared to standard OS-level scheduling, and reduce power consumption by an average of 12% for long-term tests. The research described in this paper is partially funded by the Tiroler Zukunftsstiftung as part of the “Parallel Computing for Manycore Computers” project.